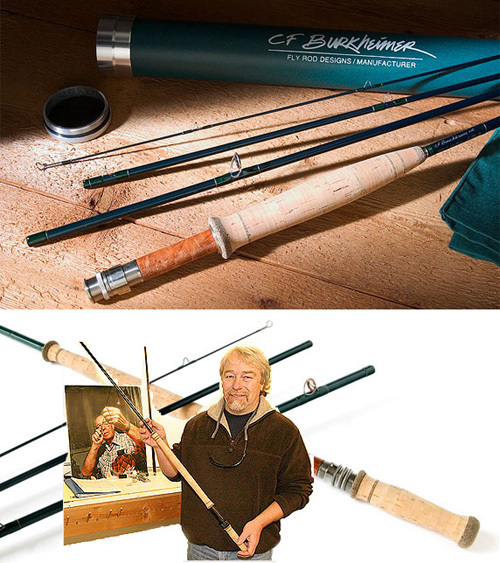 CF Burkheimer Rod Company has been designing and manufacturing graphite fly rods since 1980. Their unique niche in the industry has been working directly with their customers; engineering and developing specific individual rod actions for serious anglers from around the world. There are no two anglers who share identical casting strokes and few who agree on the perfect rod action. It is this natural diversity which yields such powerful enrichment to our sport. Burkheimer maintain rod crafting as an art and have no desire for mass production runs or sales quotas. The small production enhances their ability to control every step of manufacturing, proudly offering completely hand-crafted fly rods made in the United States one at a time to insure a high standard of quality - their motto is 'one of a kind, one at a time'. Through intense R&D, each detail is worked then reworked, to provide the very best in performance, durability, uncompromised craftsmanship and angler satisfaction. Burkheimer regularly fish with their own rods as time on the water has provided the greatest insights to rod design and innovation. From the initial concept to the finished product their goals are simple and direct; to design, manufacture, and continually create the finest fly rods in the world. CFburkheimer two-handed rods have become among the most popular rods on international steelhead and salmon rivers and are the ultimate angling tool for anadromous fish on medium to large size rivers. Who wouldn't desire improved casting distance, better line control, and superior fly presentation? The two-handed rods have revolutionized steelhead and salmon angling simplicity. Anglers of all skill levels are discovering the benefits of two-handed rods. Spey casting is easy and, more importantly, essential for proper water coverage. There is no need to wade deep and chance walking into the fish. The long rod allows the angler to stay in tighter along the shore while casting the distance to prospective fish lies. Back casting is unnecessary, so, no more headaches untangling the leader from brush behind you. Two-handed rods handle wind effortlessly and their increased power and greater leverage provide excellent line control in virtually any wind. If you have ever fished the Thompson River, you know what it´s like to feel small. As you reach out with your farthest cast, there always seems to be a current edge just beyond possible. The 10153 was built for these situations. No steelie will go uncovered with the big rod in hand. The CF Burkheimer 8139-3 an all round, do it all rod. 600 SA Skagit Extreme cast very nice on this rod. I can pick up to 12 to 14 foot Sink tips with this rod with little effort. 2009 Rod: When Kerry Burkheimer built the 8134 (13'4 for a #8), he built it with love. The 8134 is slowly becoming a favorite in the Burkheimer family of rods. The tip is a little more forgiving than 8139 giving the caster a little more feel for what the rod is doing. With that said, this rod does not lack in power. ?It may be one of the best rod for Skagit style casting on the market? The CF Burkheimer 8128-4, 12'8" 8wt Weight Spey Rod is my go to rod for Winter Steelhead. Double spey, Perry Pokes, Snap T's right or left handed did them all easily. The cast were in the 70 to 90' range no need to cast long here. We will use this rod most of the winter and post updates as we go. Come by and drop in and visit us at Lost Creek Fly Shop. Demos can be setup for you to cast the rods on the Cowlitz river and discover for yourself what a Burkheimer rod can do you for. 2009: The C.F. Burkheimer (12'7 for a #7) is a wonderful summer steelhead rod. It's light, snappy, and extremely responsive. If you're a floating line junkie, this rod is for you! This is a SWEET ROD for swinging small wet flies in classic water such as the Kalama, Grand Ronde, Klickitat or the Cowlitz when the flows are 3500cfs or 2500cfs. If your Using a 7/8 Airflo Delta spey or a Scientific Angler Spey Skagit Deluxe 400 to 450 grain head this is a classic little rod with a special touch. CF Burkheimer 11'5" #7 Weight Spey Rod. Perfect rod for anything from 4 to 12lbs. 480 Airflo skagit switch works the best for skagit heads. This is by far my go to rod for summer, winter steelhead, coho, and chum salmon. Very low swing weight, and has all the burkie qualitys of the big rods. I've landed some big 12 lb silvers and chum with no problems. Can not say enough about this little spey rod! The 7133 is my go to rod for summer steelhead. In fact i have two of them now. One i fish, and other one is rigged up with a different fly so i don't have to change flies! My go to line on the 7133 is a SA Skagit Extreme 510. In my opinion the its the best 7wt spey rod there is. Two-handed rods are synonymous with Spey casting. Some anglers come to embrace Spey casting for its seemingly effortless delivery, some for its romance and grace; whatever your draw there's no denying the amazing utility of these rods in a wide variety of fishing situations. Steelhead and Spey flies on the Cowlitz? Got it. We design rods with wide grain windows, forgiving actions and loads of feel. Feel might seem like an esoteric thing, but it's the tactile expression of the soul of a rod. Rods with feel enhance an anglers performance and enjoyment, and those things aren't just the domain of guides or instructors. Talk to us about these rods and you may hear us describe them as having "grunt", or "whump" or "hooahh". That's the Burkie feel, and you'll feel it too.